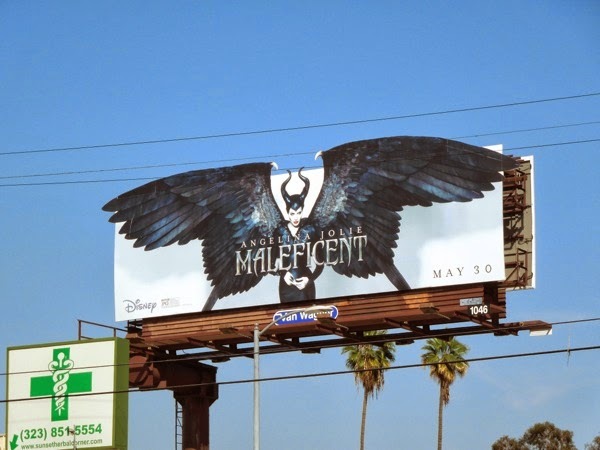 There are some billboards that just come along and make you go "wow" and this captivating ad creative for Disney's live action fairytale, Maleficent, starring Angelina Jolie in the titular role is simply breathtaking. 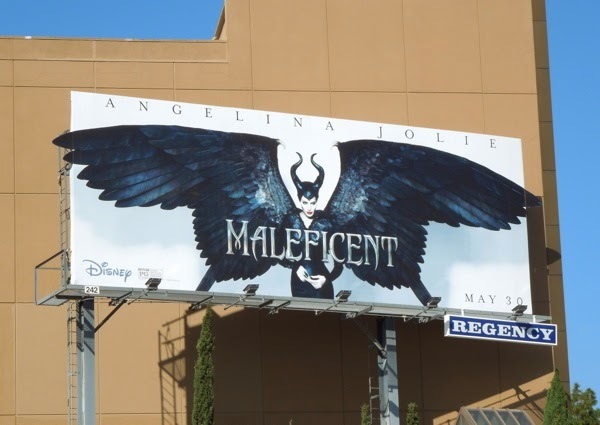 Daily Billboard isn't sure how much of a compliment it is to say the actress is perfectly cast in this role as the infamous villain from Sleeping Beauty, but her own striking features with the help of some prosthetic makeup cheek bones, horned head-pieces and black raven-like wings make for some truly traffic-stopping billboards. 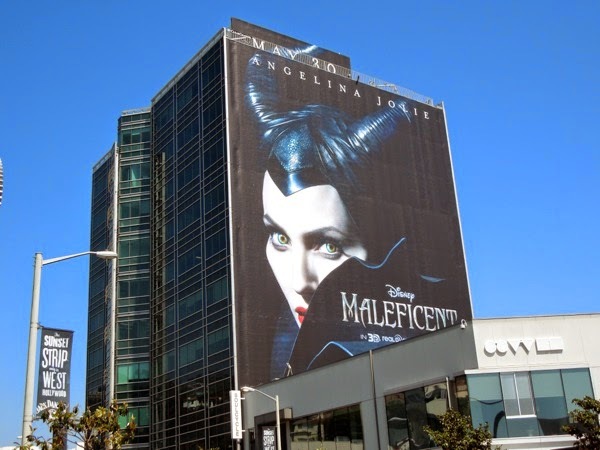 Robert Stromberg directs this dark fantasy about Disney's most iconic villain from the 1959 animated classic Sleeping Beauty and it seems that it's started a bit of a trend, as a live action Cinderella is already in the works. 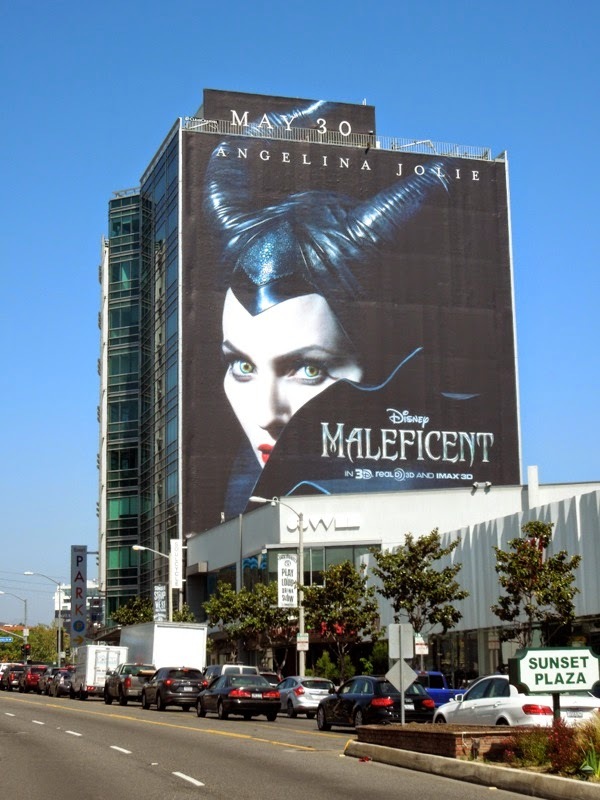 This untold tale reveals the events that hardened Maleficent's heart and made her cruelly curse the king's newborn infant, 'Princess Aurora'. 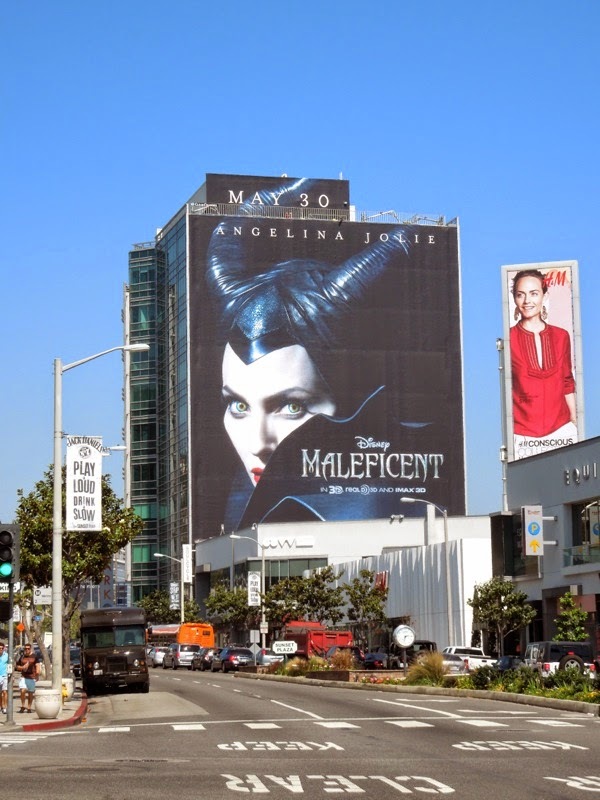 In the movie the actress also got to work with one of her own children, Vivienne Joile-Pitt, who plays the young 'Aurora' (and Elle Fanning plays the grownup Princess). 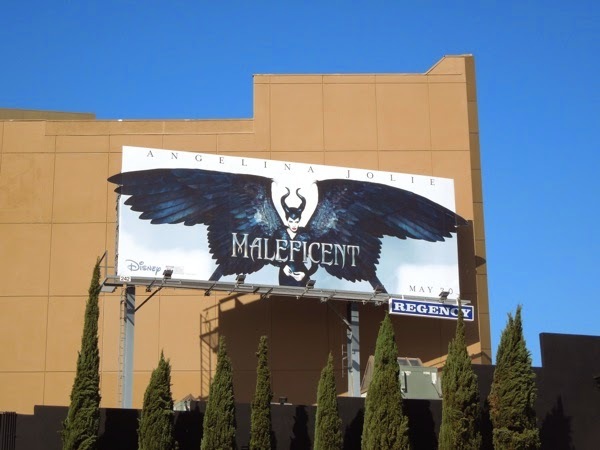 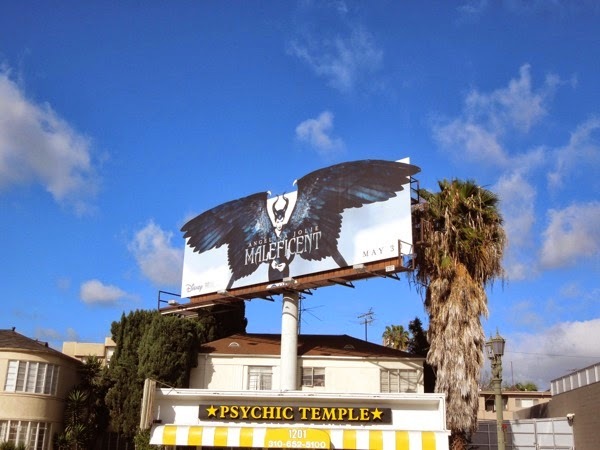 These arresting winged special extension billboards were spied along Sunset Plaza on March 18 and spotted a few days later further east along Sunset Boulevard and also along La Cienega Boulevard on March 21, 2014. 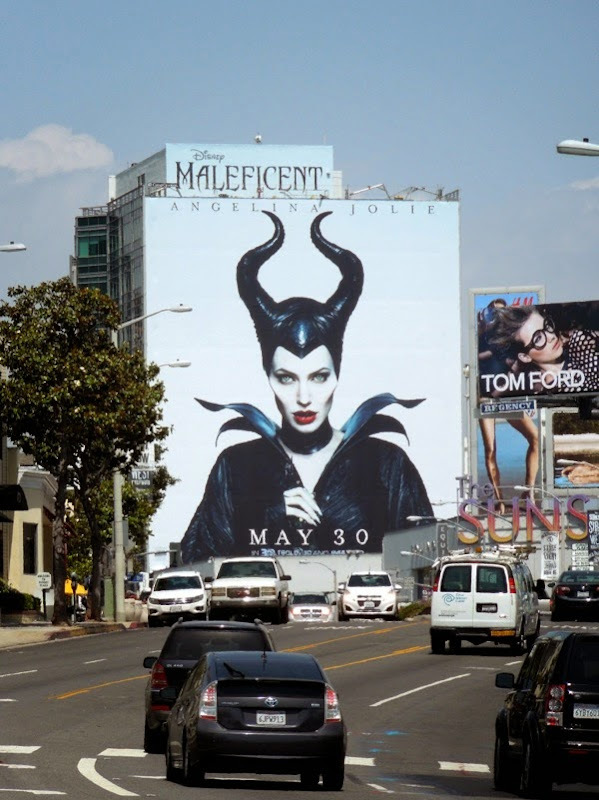 Daily Billboard doesn't doubt there'll be more outdoor ads yet to come for the movie opening at the end of May, but if you need your Angelina Jolie fix until then, be sure to check out these Salt movie billboards and film billboards for The Tourist. 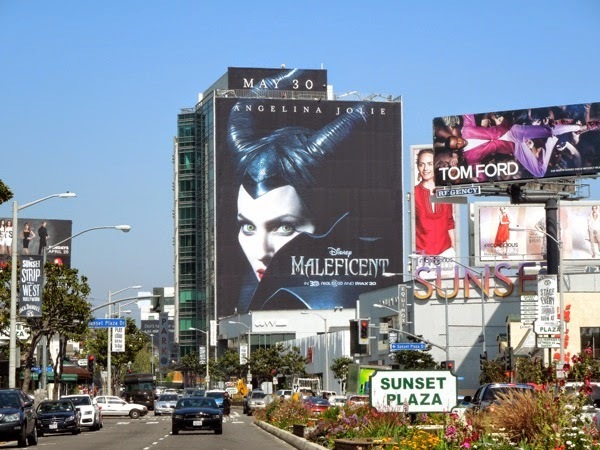 Plus if you're a Walt Disney fan, be sure to also take a look through all these Disney billboards that have graced the skies of L.A. in recent years, from movies, to games, cruises and theme parks. 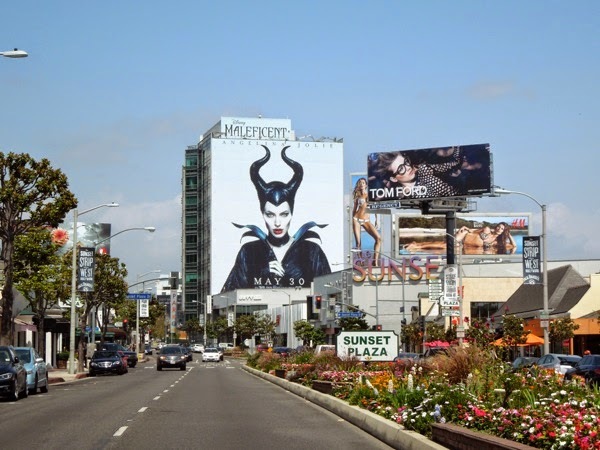 UPDATED: Just as expected, there was no way that Disney wasn't going to give this live-action their prime giant-sized ad location along L.A.'s Sunset Plaza, and it's a real head-turner, quite literally. 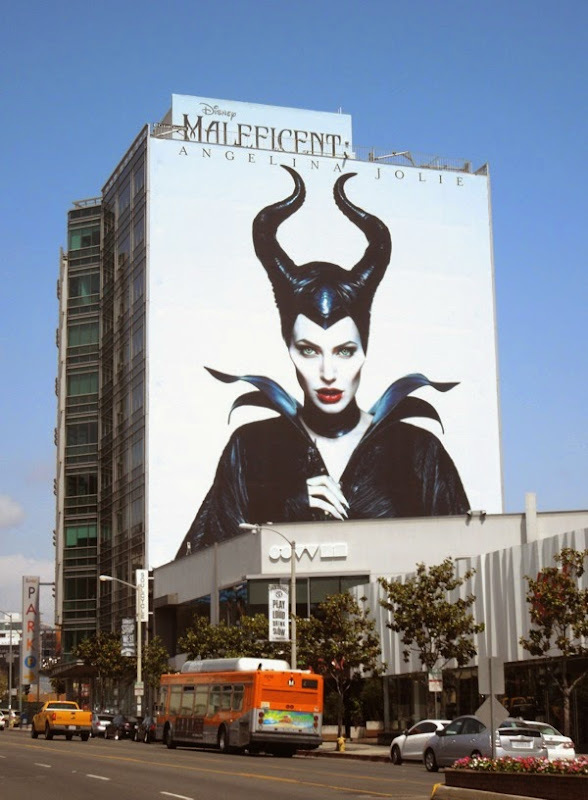 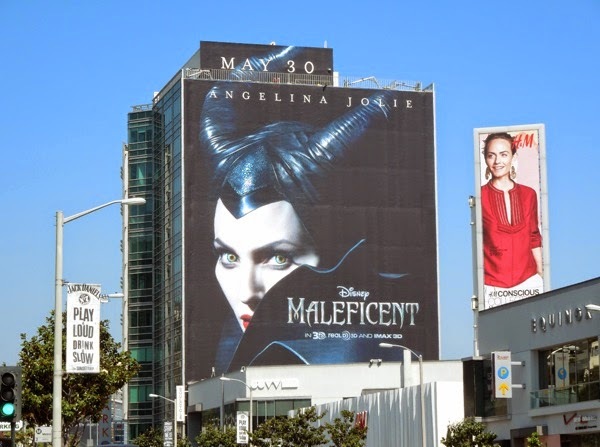 Angelina Jolie has never looked so wickedly appealing and as you can see, this super-sized creative for Maleficent really stands out amongst all the other billboards crowing the Sunset Strip skyline. 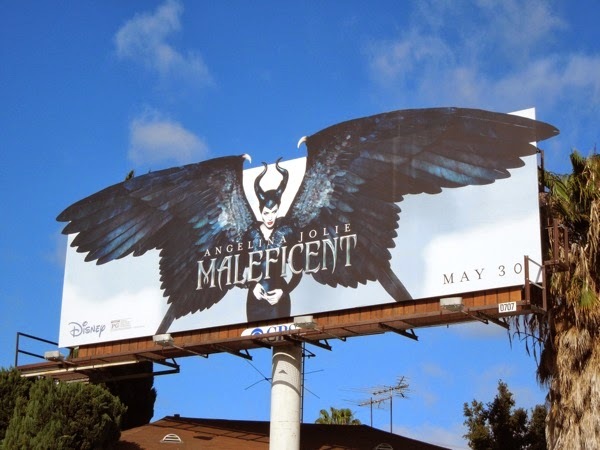 The billboard is made even more striking being almost all black, compared to the clank and white winged versions, with the iconic Disney villain's white face even more arresting peaking out from that darkness. 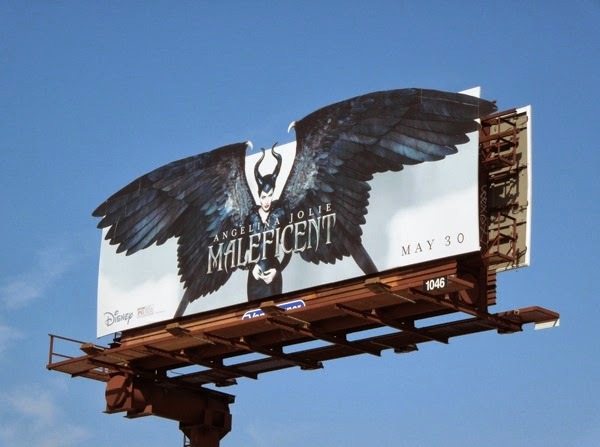 It's been some time since Daily Billboard has been so excited for an original live-action Disney movie, so let's hope that Maleficent lives up to this devilishly tempting ad campaign. 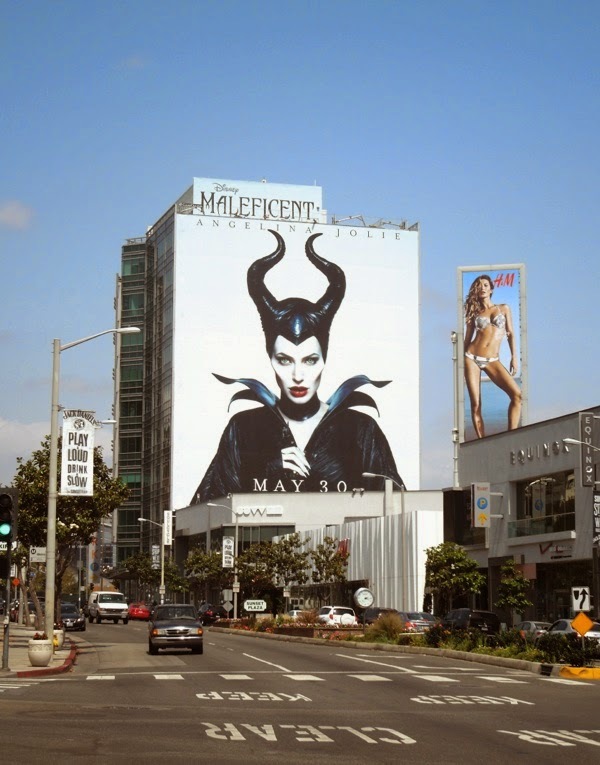 UPDATED: Daily Billboard is also loving this 'horns' creative for Maleficent enigmatically looking out over Sunset & Vine in Hollywood on April 29, 2014. 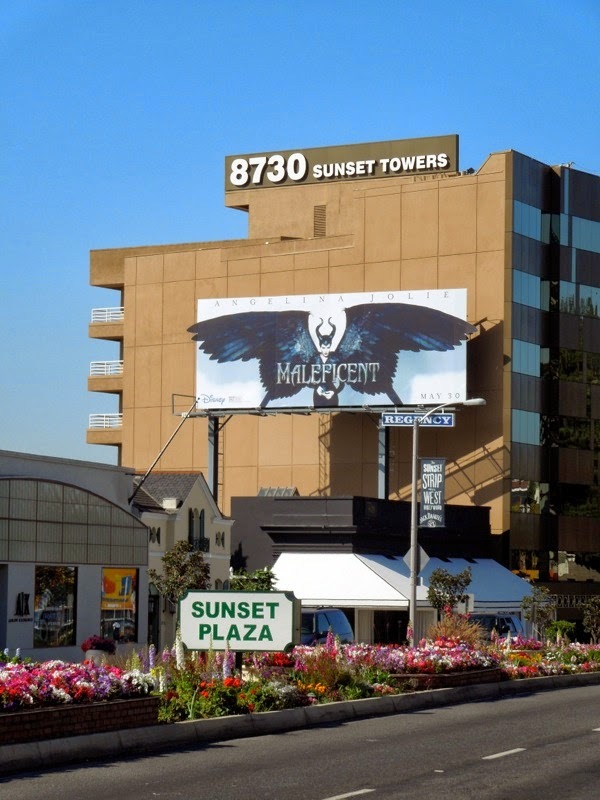 Plus here's the same 'horns' creative on a larger scale, taking over the prominent Sunset Strip location. 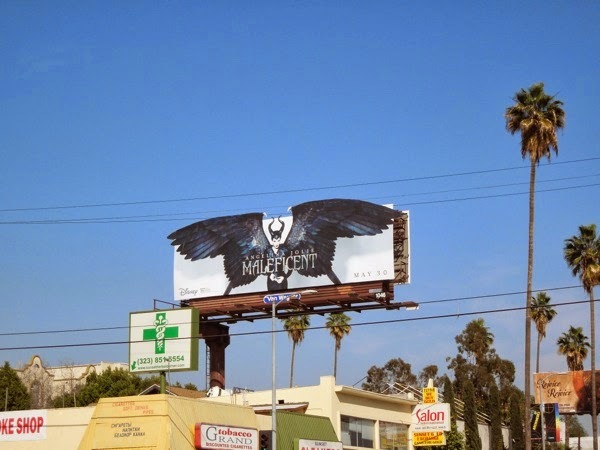 As you can see this striking imagery makes quite an impact, from close up and from a distance, as you travel along the busy L.A. commuter belt on May 7, 2014. 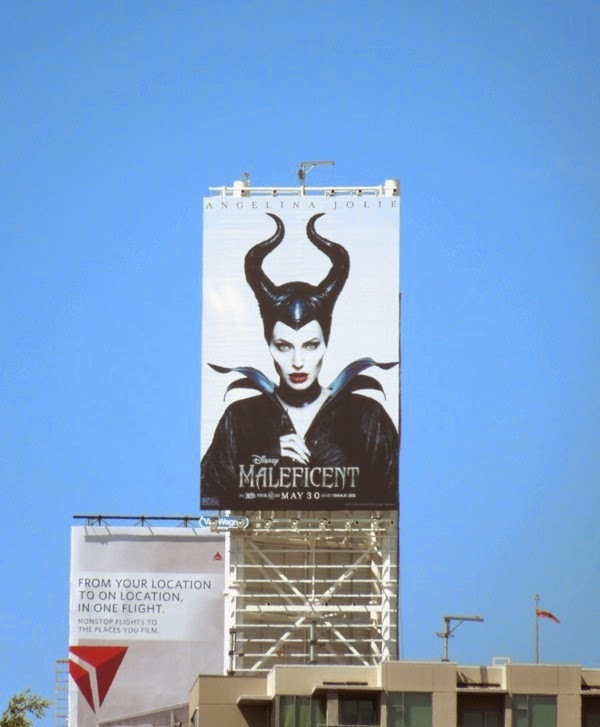 Other overseas territories have opted for a more Disney fairytale approach, tying into the Sleeping Beauty mythology with their marketing for Maleficent, but these bold billboard creatives are far more Daily Billboard's cup of tea. 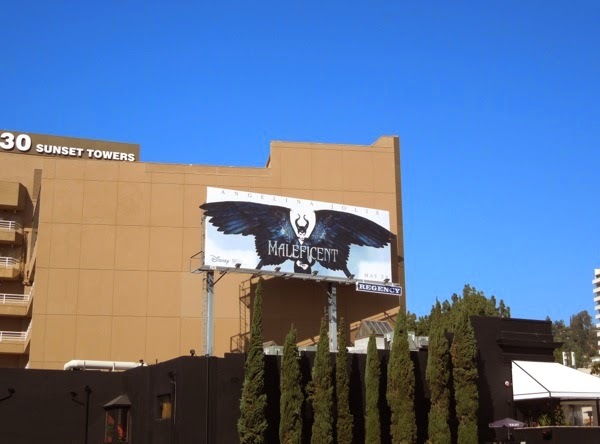 Plus if you're a fan of this fairytale icon, be sure to take a look at these original movie costumes from Maleficent on display too.